Piglet Wine Bar is a trading name of Transalpino Catering Ltd, a registered Irish Company, Number: 574988. Company Directors: Thibaud Harang, Enrico Fantasia. 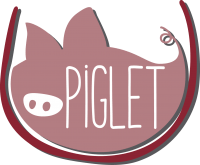 Piglet Wine Bar operates http://www.pigletwinebar.ie (the "Site"). This page informs you of our policies regarding the collection, use and disclosure of Personal Information we receive from users of the Site. You can also call or email us directly for bookings. For bookings of 6 or more, please get directly in touch with us.